Every now and then I come across a more unique health food that even I haven’t tried, however I do have some health nut friends that swear by this stuff. It’s called Quinoa (pronounced Keen-Wah). Quinoa is generally confused as a type of grain. However, the real truth is quite the contrary to the belief, as quinoa is not actually a grain but rather the seed of a leafy plant that is in the spinach family. Here’s just a small list of the benefits of taking Quinoa in a list by Nutrition expert, Batul Nafisa Baxamusa. Quinoa is very good for people suffering from migraines, diabetes and atherosclerosis. Quinoa is a good source of magnesium, that helps relaxing the blood vessels and preventing the constriction and dilation that is observed in migraines. It also contains riboflavin (vitamin B2) that is very important for producing energy within the cells. Vitamin B2 has been known to improve the energy metabolism within the brain and muscle cells, thus reducing the frequency of migraines. Magnesium found in quinoa also helps in relaxing the blood vessels. Thus, making quinoa an excellent choice for people suffering from hypertension, ischemic heart disease and cardiac arrhythmia and helping in improving the cardiovascular health. A study conducted with post menopausal women with heart diseases, high cholesterol high blood pressure, etc have shown low progress in related cardiovascular diseases. These women were asked to eat 6 servings of whole grains like quinoa every week. 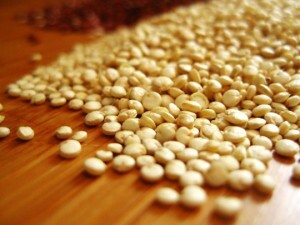 Quinoa contains manganese and copper, that are the co-factors for super oxide dismutase enzyme. This enzyme helps protect the cells from damage by free radicals. A study has also shown that foods containing high insoluble fiber like quinoa have helped avoiding occurrences of gallstones in women. If you are a vegan than you most likely have heard of Quinoa because it’s an incredible source of high protein that also contains all of the 9 essential amino acids within it. It is a great source of magnesium, iron, copper, phosphorous and even manganese. It has slow releasing, high level of carbohydrates, that give the stomach a full feeling for a long time which in essence curbs your appetite. Thus, making it good for people who are watching their weight and need to maintain adequate blood sugar levels – this is also a benefit of taking whey protein powder. Because the two curb your appetite for a while it helps you avoid snacking or grazing throughout the day. Anytime you can find a food or supplement that’s extremely high in protein like Quinoa or whey protein it’s important to utilize them in your dieting because ultimately it will help you lose weight while loading your body with nutritional benefits. Hope you enjoyed the read. If you have any other questions or comments please feel free to leave them below.